In disciplining a growing child, a parent wears many costumes: You put on your policeman’s cap for dangerous situations, your preacher’s collar for morality lessons, your diplomatic tie and tails for power struggles, and your doctor’s coat for healing little hurts. But the costume that will serve you best during tough discipline times is your jester’s cap. Three-year-old Alan had a habit of darting away from his parents, especially in parking lots. Dad decided to play the blind man’s game. As they came out of a store, Dad put his hand over his eyes, gave the child the car keys, and said, “Please hold my hand and lead me to the car.” Of course, he peeked a lot. Children can look at your face and realize when you are going to say no to something. They are already mustering up resistance; you break through by putting on your best comic mask. Using humor for discipline also helps snap a child out of regressive behavior. Here is how a mother in our practice solved this problem: Four-year-old Monica insisted on wearing a diaper because her new brother did. Mother played along with Monica’s game by trying to put a small, newborn-size diaper on her. As they both struggled to get the diaper to fit, Monica realized how silly her whim was. We use humor quite often to give a child a second chance to obey. Our children love videos, so we put on our “rewind” theatrics. “Matthew, please help me clear the table.” “But Dad,” Matthew protests. Immediately I say “Rewind!” I step back a few feet and start over, this time making a grand gesture toward Matthew, indicating the cue for his second chance. This approach usually results in both laughter and obedience. There are times when your child’s behavior is no laughing matter. Also, children are sensitive to ridicule and sometimes take your humor as a sarcastic put-down, even when you may simply be trying to bring a bit of levity to a tense situation. There are times to be serious, and there are times to be funny. Both have a place in disciplining your family. Much of your discipline can be amusing to your kids, and it’s fun to have an admiring audience. 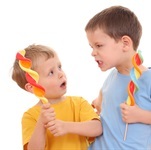 Continue reading to learn more from Dr. Sears on disciplining your child.